Ogee/Curlicue Quiltalong and Pattern Giveaway! I’m excited that people want to quilt along with me to make an Ogee (aka Curlicue) quilt! The first step in quilting along is to acquire the pattern; you won't be able to follow along without it. As I mentioned last time, I know that lots of folks may already have it (although I haven't seen many quilts made up from it yet - I have been given permission to show the two I have seen - besides Rebecca's original and mine - here in this post). If not, you can buy it for a very reasonable price at Rebecca’s online shop. For me, the best thing about buying from her shop is that the pattern is available via download – it comes in a .pdf file that you can print out, or just read on your iPad immediately, with no need to watch the mailbox. Made by Penny at sewtakeahike. Because she is the sweetest lady in the southern hemisphere, Rebecca is donating three copies of the pattern for a giveaway to inaugurate the quiltalong! She is excited to see all the new versions of her quilt that we will be creating! I'll leave the giveaway open until April 22, when the Passover seders are over, then I'll draw the names of the winners. In the meantime, think about what fabrics you want to use! I am walking on air because I managed to create my very own button for the QAL - you can find it over on the right panel of my blog, and I am attempting to embed it in this post, as well. Html and I are only nodding acquaintances at the very best, so I'm counting this as a real victory. You can grab the code if you would like to add the button to your blog. I also started a Flickr group, where we can post photos of fabric selection and ongoing progress. etc. So if you are going to quilt along, go over and join the Flickr group. Throughout: Plenty of encouragement and camaraderie! So without further ado, let's proceed to the giveaway! To qualify for a chance at one of the patterns, leave me a comment telling me what fabric line or colours you would choose for this quilt. I will choose three winners at random on April 22. I can't emphasize strongly enough that if you are a no-reply blogger, I probably cannot contact you if you are a winner. (I really blame Blogger for not making this clear to people - I am sure most no-reply bloggers think they are not, since they have to enter their email address whenever they leave a comment.) Also, if you are a blogger intending to quilt along, please leave your blog title in the comment and I will assemble a blog roll for the sidebar. LOVE the pattern and I think I would use one of the newer lines of fabric, maybe Strawberry Fields to see what it would look like with a lighter line of fabric. Thanks! if i were to make this quilt, it would be a scrap quilt because that's the kind of quilt i prefer. so to the stash I'd go... lovely giveaway! best of luck with the quilt-along, i'll be watching from the sidelines! Wow, this quilt is fantastic and I want to make one! Mostly because any kind of curve scares me so much I try not to even dwell on it for long. I have only been quilting for a little over a year now. I think I would certainly learn a lot. Not sure What line I would make it out of. Maybe some Kaffe Fassett? Quilt-A-Long = FUN! I think that I would probably use some Heather Ross Mendocino mixed with some scraps I have. Thanks so much for the giveaway! My blog is Distant Pickles... I think it's linked in my profile. Not up for the QAL time wise right now, but you know I'm going to be following along, droolingly over all the beautiful fabrics and colors everyone chooses! I have been eyeballing this pattern for so long now, thanks for doing this quilt along, It's the kick I need to finally tackle those curves! I am undecided on the fabric. I don't know if I want to use a FQ bundle I have or put random fabrics together. My first thought was to use Parisville, but I just used that up on the Supernova Quilt Along. We'll get a post up soon about the QAL! Thanks!! I will start with some Japanese fabrics and if I'm not happy with how the work together I just might mine my stash. Too bad there aren't more pictures of completed versions of this quilt or I'd have a better idea of what fabrics I like or don't like for this particular quilt. I was thinking about pulling out my batiks. I have a lot of blue-green-purple colors. I may sprinkle a grey in there too. I have actually been thinking about this quite a bit. I like the idea of a Honey Child quilt because of the organic swirls and paisleys, but I'm also thinking that Hello Betty might be fun--mixing it up with geometrics! I LOVE this pattern and would use all the scraps left over from my girls sundresses and skirts that I've been sewing! THANKS for the chance! This is one seriously awesome pattern! I have a messload of purple fabric (no specific line, just a whole BUNCH) and a daughter who loves, loves, loves purple! I love your version of this quilt! I would love to win a pattern. I think I would use some of my sanctuary fabrics in the cool tons. Blues, greys and greens! I have a sweet stack of Tanya Whelan florals with, of course, some Jennifer Paganelli fabrics thrown in for good measure! Great quilt a long!! Don't include my name in your giveaway and I won't be joining your sew along, but will be watching for updates and enjoying everyone's progress from the sidelines. Good luck, you're off to a great start. I'm envious of your button making skills and how organized your sew along is! Shoot! I just put myself on the tightest budget ever so I can't buy anything right now. So please pick me because I want to play along. Pick me! Pick Me! I would love to try this pattern. I can join a QAL, but may have to go slower. I have so many stash fabrics that may work - I'll have to take a look. Otherwise I may get some Fandango or some Central Park to make it since I love those but haven't put either into a project yet. I love the pattern and the originals on your blog. I would use blues and soft yellows or else I'd use Christmas fabrics. Thanks for the giveaway! I'm considering using Odyssea for this quilt. I still need to work out the details in my head, but I'd like to try something different. 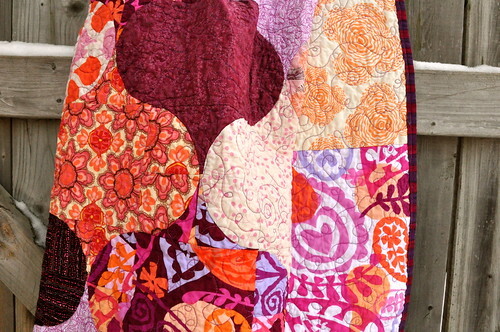 I'm not sure if I'll be able to quilt along, but if I do, I'll be blogging about it at http://www.fabricdonkey.com. I'm thinking this would look beautiful in some of my OOP Amy Butler prints. Oh, now I'm going to be dreaming about this pattern and AB fabric all night! I would love to make this. If I do I would use all the large print flower pieces I have in my stash. Beautiful quilt! 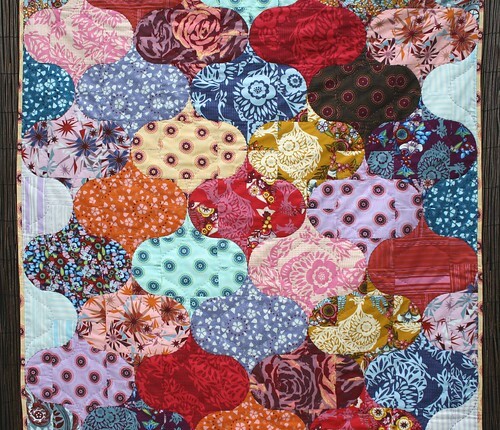 If I made this quilt I would use batiks, thanks for the giveaway. Beautiful quilts! I think I would make this in aqua and lime green. Very cheerful for spring. I have a stack of fabrics in those colors ready to go. I think all those quilts look just gorgeous with all the different lines used. I would use Kaffe Fasset's fabrics with it. It would really show them off nicely. Thanks for the chance to win the pattern. Wowee, I love your version! so fresh! I have a bit of a thing for Ty Pennington's Impressions at the moment, so if I win and join your QAL then I will use the green selection! Wow I'm loving that pattern.. I see it in a whole new light after seeing it on your blog. If I were lucky enough to win, I would like to do it in the colors of fall, Reds, oranges, yellows, rusts.. Mmm, I can see it now! What a great giveaway!! I think that I would use a primary colors for this one! And wouldn't it look pretty in Christmas-y colors, too? I love the curlicue pattern. I would love to make mine with the rich colors and prints of "Scarlet Penelope Three" by Holly Holderman! I would probably choose blues/ or blues/purples. Then again I might do another in christmasy fabrics. This is a great pattern. I have a nice collection of Kaffe Fassett fabric which would like mighty nice done up this way. Thanks for a chance to win. I would use my stash and make a scrappy version! I'd use purples because I've been collecting all sorts of purple patterned fabric. Beautiful quilt! If I were to make this, I would like to use aquas and teals. Thanks for a chance to win! I have been hoarding a stack of fat quarters-large florals and polka dots in deep blues, periwinkle, and bright yellow/green. I think they will be perfect for this quilt. Thanks for the oppurtunity to win the pattern. I've been looking for a nice pattern for some Central Park. This could be it! I have no idea what fabrics I would choose. I generally don't buy "lines" but instead buy bits and pieces of what appeals to me. I do, however, have quite a bit of purples and yellows that I think would play well together (maybe). I would qal if I won the pattern but cannot afford a purchase at this time since my car died and I am forced to be on the market for such a big purchase UGH (hate it when life gets in the way). It's beautiful. I'm thinking maybe one of the aviary 2 colorways, perhaps the yellow/granite one. I love your idea of doing this pattern in solids. If I'm lucky enough to win I think I'd like to do a version in shot cottons and solids, probably in blues and greens because that's what I have in the stash at the moment. I can't wait to see everyone's quilts! Thanks! I have this pattern and so how can I refuse a quilt along to give it a try. I don't know what fabrics yet, my rule for quilt alongs is to try to use something I already have on hand, but I have yet to make a choice. I have loved that pattern since I first saw it. It reminds me of Christmas ornaments, so I think it would be awesome in Christmas colors, or a Christmas line of fabrics. I'm thinking of arranging my curlie-ques in alternating columns od kona lemon (or cactus? ), coal, and ash. Not 100% sure if I can QAL yet - depends on when it starts and some of my other real life obligations. :/ If I do my blog is kelseyprantis.blogspot.com. What a great idea! Love the pattern and would love to QAL. I think it would look stunning in any color combo, actually. I think I'd use different shades of green to represent nature. I love this quilt! 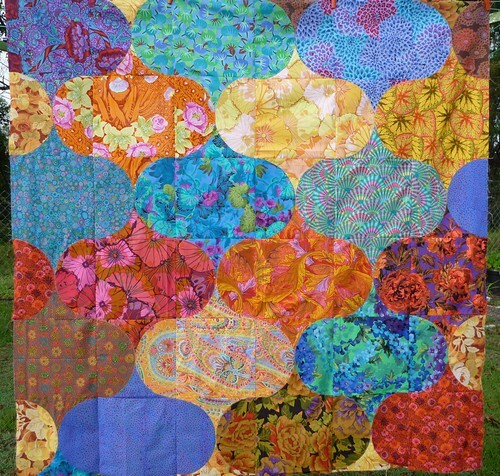 I think I would do a bunch of big kaffe fassett- style prints. I've been wanting to do this quilt for a long time! I love this pattern and would love to do the quilt along. I've been collecting greens for my granddaughter. This pattern would be great for them.